Fancy creating your very own mini Apple IIc powered by the awesome Raspberry Pi single board mini PC? If you do then you will be pleased to know that Charles Mangin has created 3D printed files that are now available to download from the Thingiverse website. To complete the setup Mangin has also created 3D print files for the Apple monitor which are also available to download and can be equipped with a working 2.5 inch LCD screen. Creating a perfect 1:4 scale model of the original Apple computer that can actually be used once a full-size keyboard and mouse are connected. 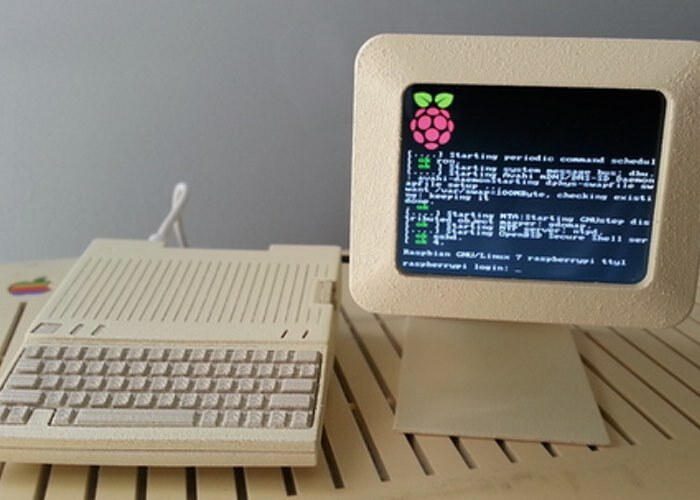 Watch the video below to learn more and see the miniature Apple system in action powered the a Raspberry Pi. If you are also looking for a touchscreen display to use with your Raspberry Pi computer, the Pi Foundation has today made available their new 7 inch touchscreen display that is capable of supporting 10 finger touch, and is available to purchase at an amazing price of just £48. For more information jump over to our previous article located here. For more details on Raspberry Pi displays and HATS jump over to our essential guide.